The Quantitative Centripetal Force Apparatus' simple concept and robust construction guarantee reliable lab success. A hanging mass and a counter-balance are attached to a horizontal bar mounted atop a vertical shaft about 45 cm high, and the suspended mass is tied to the vertical shaft with a horizontal spring. When the shaft is spun, the suspended mass swings away. The displacement at any given speed is marked by a vertical mounted pointer that can be moved laterally to match the pointed tip of the suspended mass. From the mass, the speed of rotation, and the radius, users can calculate the centripetal force. 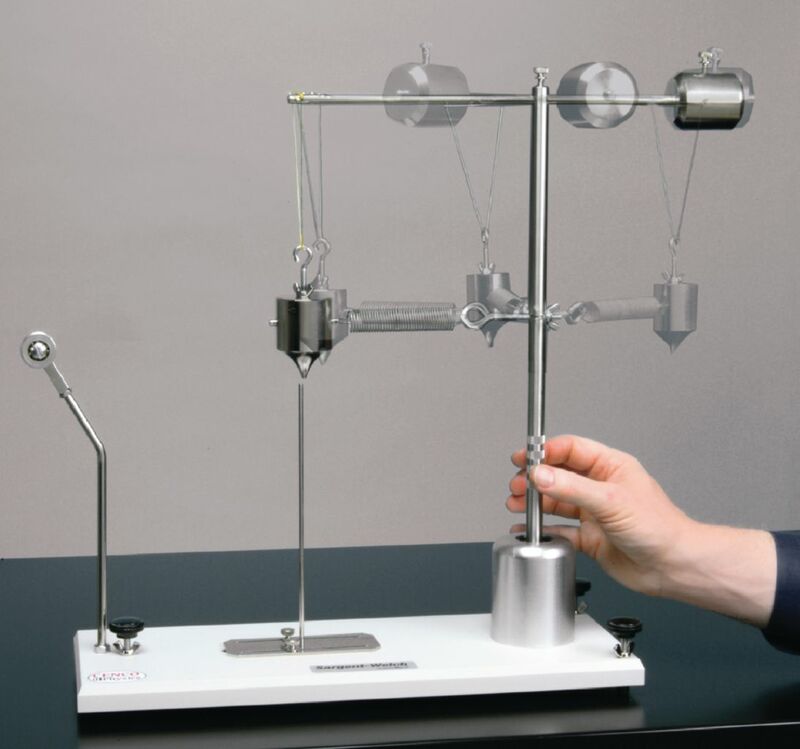 Using the included weight hanger and ball-bearing pulley, they can measure the force required under static conditions to displace the mass the same distance against the pull of the spring. Spring and mass are built to ensure a rotational speed slow enough to be safe and easily counted. The vertical shaft rests in a ball-bearing mount that minimizes wobble and friction. The entire device is mounted on a 15 x 41 cm base with three adjustable feet. The Moment of Inertia accessory, a 34 cm threaded rod slotted weights can be clamped to, is also included. After mounting the rod at the top of the shaft and adding weights, the weight hanger and its weights are allowed to fall, accelerating the system. 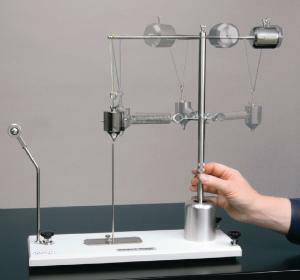 From the weight hanger's change in position with time, users can determine the moment of inertia. Ordering information: This kit a weight hanger, hook, cord, and complete instructions. A slotted weight set is required but not included.